WAGENCY facilitates the transaction and fair remuneration of artists' labor in the nonprofit sector. It supplies artists with digital tools and the necessary collective agency to negotiate W.A.G.E. 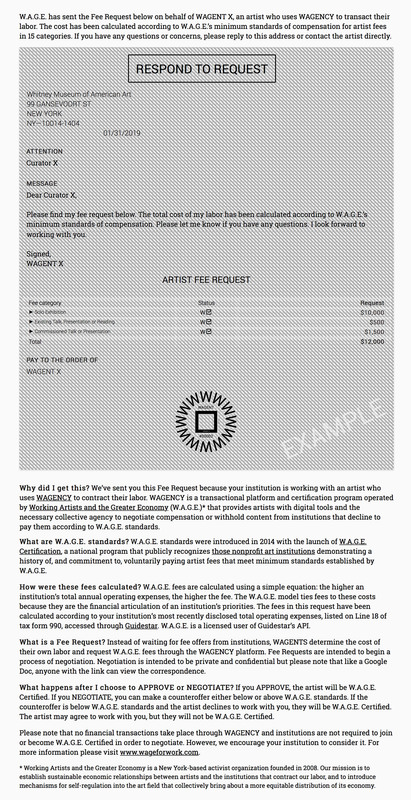 fees or withhold content from art institutions when they decline to pay according to W.A.G.E. standards. Instead of a coordinated strike mechanism, WAGENCY enables a matrix of individual boycotts that can and will happen at any given time. Follow a simple 5-step process to increase your bargaining power with institutions and build collective strength together with other artists. W.A.G.E. fees are calculated using a simple equation: the higher an institution’s expenses, the higher the fee. If you have been engaged by a nonprofit institution to provide content and want to be paid according to W.A.G.E. standards, you'll need to know its total annual operating expenses. WAGENCY grants access to a database containing this and other information from the public tax records of thousands of nonprofits across the U.S. W.A.G.E. is a licensed user of GuideStar, the world's largest source of information about nonprofit organizations. 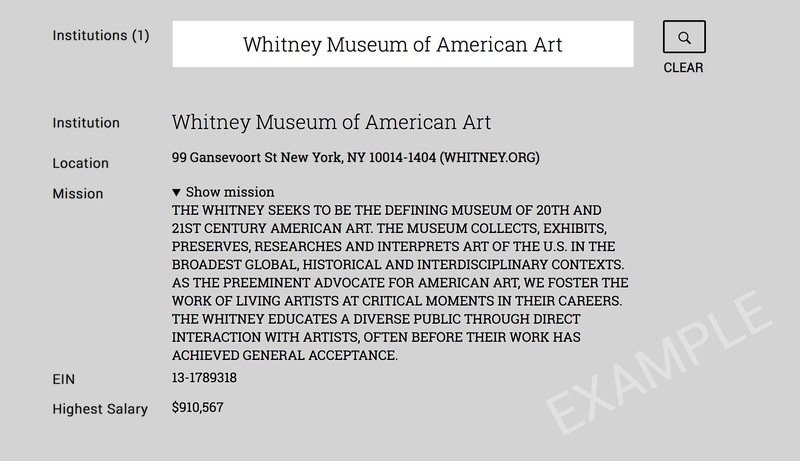 Click the 'read more' tab below to view an example of an institution search using the Whitney Museum of American Art. Instantly generate a customized fee schedule for W.A.G.E. fees in 15 categories and use it to determine the total cost of your labor. For example, if an institution has invited you to have a Solo Exhibition and give a Commissioned Talk, the schedule will list these, and other forms of content, along with their minimum costs according to W.A.G.E. standards. 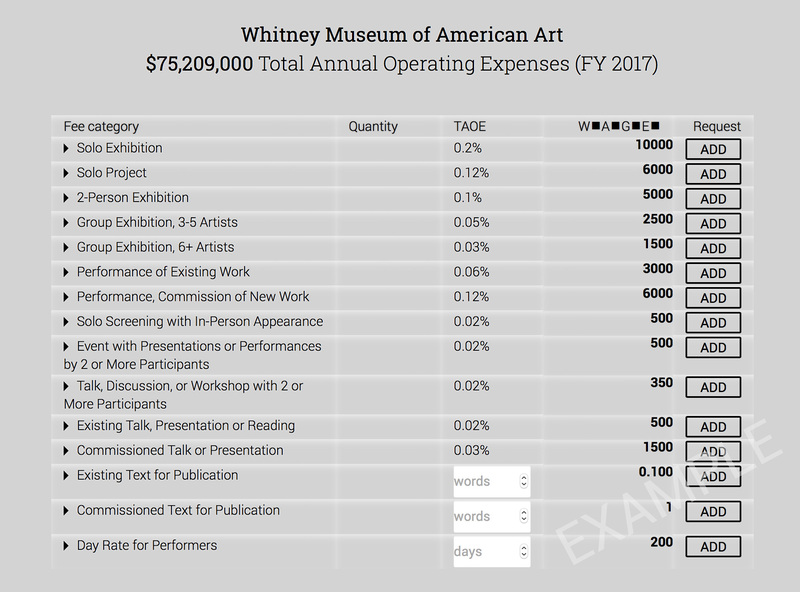 Click the 'read more' tab below to view an example of a minimum Fee Schedule for the Whitney Museum of American Art. WAGENTS don't wait for institutions to offer arbitrary fees. Instead, WAGENTS determine the cost of their own labor and request W.A.G.E. fees through WAGENCY. Fee Requests are dynamic, fillable forms sent from W.A.G.E. to any email address on your behalf. Fee Requests initiate a process of negotiation that can take place online in real-time or through a series of email exchanges. Correspondence between WAGENTS and institutions is private and confidential. 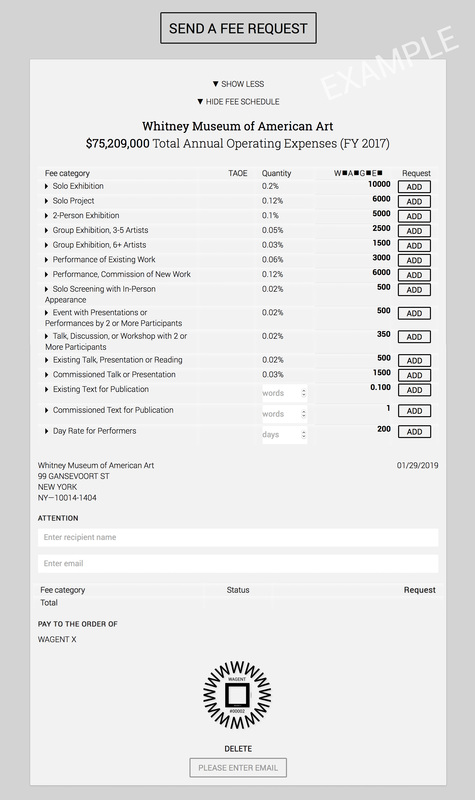 Click the 'read more' tab below to view an example of a draft Fee Request for the Whitney Museum of American Art. (1) If the institution APPROVES, W.A.G.E. fees will have been secured and you become a Certified WAGENT. (i) The institution makes a counteroffer above W.A.G.E. standards. You accept and become a Certified WAGENT. (ii) The institution makes a counteroffer below W.A.G.E. standards. You decline and become a Certified WAGENT. (iii) You choose to negotiate below W.A.G.E. standards and secure compensation. You remain an active WAGENT. WAGENCY allows you to oscillate between being certified and uncertified and welcomes all forms of participation. WAGENTS choose to be listed publicly by name or anonymously by number, and WAGENT signatures, intended to be placed on your website, are dynamic SVG files that always reflect your current status. As long as you continue to secure W.A.G.E. fees or withhold labor when not paid them, you will be listed as certified. Please note that Certified WAGENTS have an additional responsibility. They are required to pay equitably those who contribute to producing the content of their work – their studio assistants. New payment guidelines and a WAGENCY Work Agreement for assistant labor can be found here. Click the 'read more' tab below to view an example of what a Fee Request looks like to the recipient. No financial transactions take place through WAGENCY but you can request and record payments, and send reminders to institutions if payment is overdue. As long as you enter the program's start date in a Fee Request, WAGENCY will alert you if payment hasn't been recorded within 30 days of completing the work and prompt you to send a payment request. This timeframe complies with the Freelance Isn’t Free Act which protects freelance workers from non-payment and protracted or reduced payment by New York City businesses. When artists hire others to help produce their work, they function in a similar capacity to contracting institutions and are just as prone to exploiting workers. WAGENCY includes new guidelines for compensating artist assistants equitably and offers a customizable Work Agreement designed to help employing artists and their assistants determine a set of comprehensive and equitable terms upon which to engage in a working relationship. The WAGENCY Work Agreement can be initiated by assistants or employing artists. WAGENCY is a subscription-based program that costs $5 a month to use. Subscription revenue directly supports W.A.G.E.’s work as an independent organizing body and covers the annual cost of accessing the public tax records of thousands of nonprofit institutions through Guidestar. Join WAGENCY and share in the work of shifting the industry away from a dependence on unpaid labor and toward economic sustainability for those whose work it is organized around. Click here to register as a WAGENT.